Tangy-sweet glaze with just a touch of heat from optional jalapeños covers tender meatballs. SO easy to make and they are great for family dinners or appetizers, depending on how big you make them. In a large bowl, combine eggs and milk. Add the bread crumbs, onion and salt. Mix the beef in with your hands until it is completely mixed in. Gently shape into balls - larger for dinner servings 1-inch or so for appetizer servings. Place in a parchment lined baking sheet with sides. Bake, uncovered, at 400° for 12 minutes or until meat registers 155F on an insta-read thermometer. In a heavy skillet, saute garlic and jalapeno in butter over medium heat until tender - do not let the garlic get brown. Stir in the ketchup, honey and soy sauce. Simmer for about 5 minutes, stirring occasionally. Add the meatballs to the sauce. Carefully stir to evenly coat. Simmer for 10 minutes more. If you're picky about onions grate them rather than finely chopping to ensure they get cooked through. 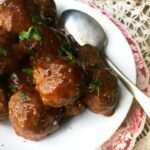 This recipe makes about 24 appetizer servings or 6 dinner size servings depending on the size of the meatballs. Nutritional info is for the dinner sized servings.